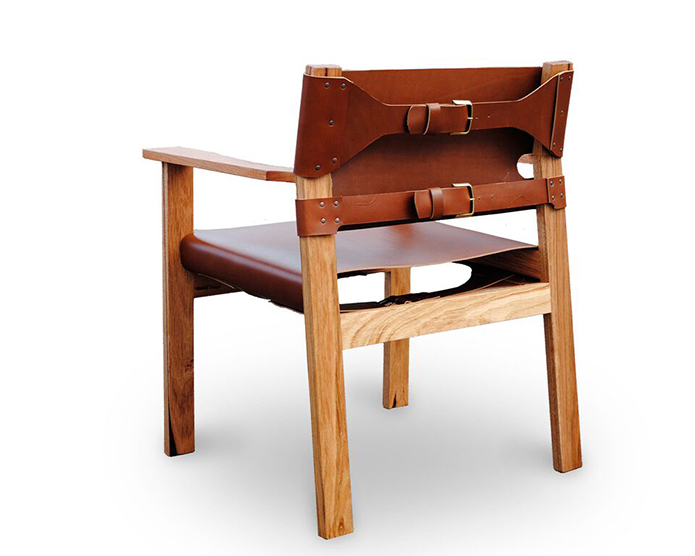 Ferrer Dining Chair by Tim Noone, furniture design, Roselands, NSW. In a world full of indiscriminate consumption, mass-production and throw-away culture, there is, thankfully a tide-turn of considered purchasing and a quest for authenticity and truth, where discerning consumers eschew the ‘cheap & cheerful’ and committed artisans strive to create longevity in careful craftsmanship. However, most consumers do not know where to start looking for a specialist craftsman who can turn their original minds-eye idea into a real-life object, and most craftsmen are not expert marketers or salesmen, building up a customer base and gaining these commissions, because of the very fact that they are passionate and talented artisans, ‘makers’ not merchants… This vicious circle of incongruent demand and supply is broken by Australia-based Makers Lane. Unashamedly the middle-men in the process, Makers Lane provide the essential missing link between the consumer and producer, within an era of evolution and continued celebration of Australian design, craft and artisanship. But what makes this three-way relationship so satisfying and soul-soothing, rather than the usual patterns of global-economics (in terms of mass-produced plastic marked-up from factory to living-room), is that Makers Lane is allowing the fulfilment of a consumer’s design idea of something bespoke, meaningful and worthwhile as well as at the same time promoting the skill and expertise of an otherwise hard-to-source craftsman. In other words, Makers Lane’s founders have created the uniquely wholesome ethos-turned-reality of bringing those with the expectation and those with the expertise together, creating a community of like-minded supply and demand. Sculpture by Clive Calder, artwork design, Sydney, NSW. Firstly, for those readers who aren’t familiar with Makers Lane, please can you explain what you do? Makers Lane is an online marketplace for custom-made items. We’re building a community of talented makers and designers across a range of specialties that love to undertake commissioned work. Our maker community currently ranges from furniture, metalwork, lighting, polished concrete, textiles and wallpaper through to jewellery and leather goods. We’re expanding our categories of makers at a reasonably rapid rate having just started including sculptors and commissioning artists as well. 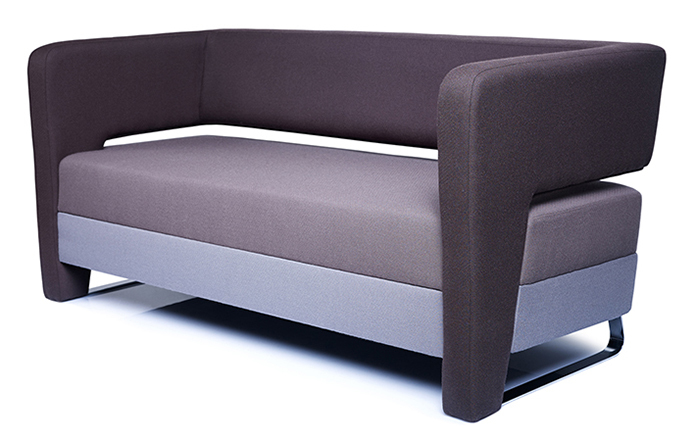 Jive Sofa by Tane Design, furniture design, Melbourne, Victoria. So how does the process work exactly? We understand that it can be hard to find someone when you want or need to create a specific piece for your home or commercial space, so we make that easy. Customers can browse profiles of Australian makers on our website to get a view of their unique style and skill. They can then commission a maker they like directly, or they can brief our community to get a range of proposals for their project. Studio Ham, lighting design, Blue Mountains, NSW. Our makers are experienced in working with customers from initial design stages through to finalising a piece. Makers Lane also offers to assist in the design process, working with the customer to refine their brief to help deliver it to suitable makers in the community. 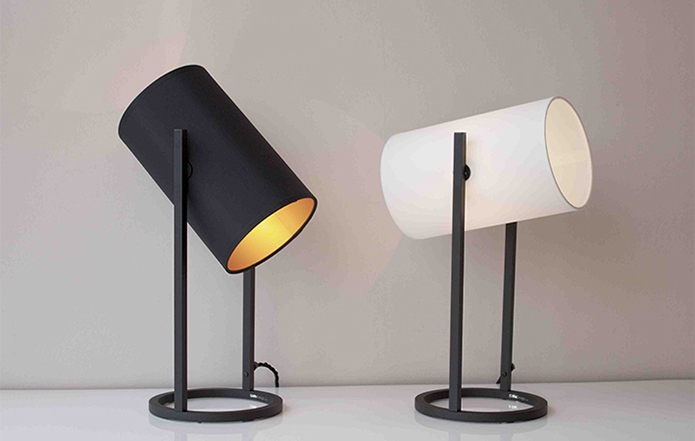 Oko Lamp by Daniel Giffin, lighting design, Melbourne, Victoria. Throughout the process, Makers Lane assists both the customer and the maker by managing the project with a flexible contract to ensure that the project is delivered per customer expectation. Makers Lane manages the whole process, from concept to delivery, including payment. We’re only satisfied when both the customer and the maker are satisfied with the end result, which we hope is a dream realised. Clare Gilligan, co-founder of Makers Lane, Australia. It is often said the design industry has the dilemma of balancing creativity with the demands of cost-effective and innovative construction. How do you feel Makers Lane can help make a difference in this regard? 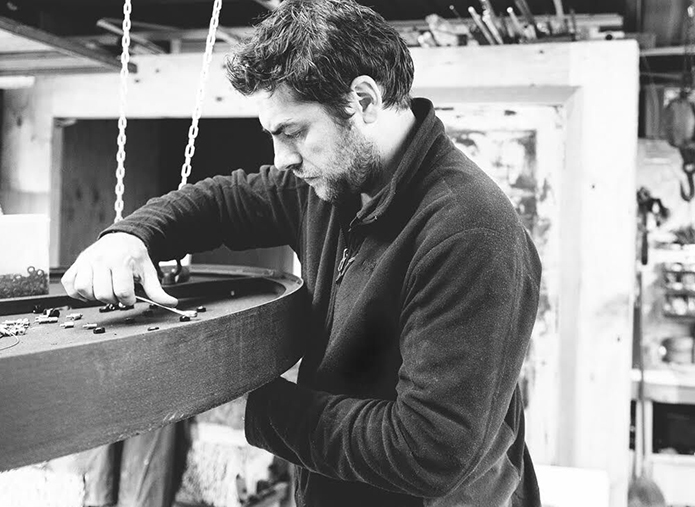 What we know is that our community is made up of highly experienced and passionate craftsmen. The sheer wealth of technical expertise and experience is a resource freely available to the designers who interact with the Makers Lane community. Often we will receive a brief that poses some technical issues with material selection or constructability and we see our maker community respond with alternate options to assist in resolving a design or functional dilemma. 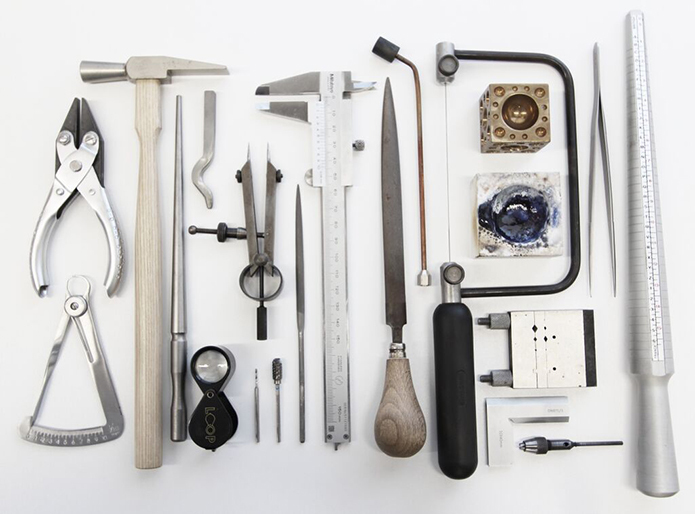 Tools used by Alistair Kelsey, jewellery designer, Jervis Bay, NSW. The best thing about custom made is that it’s really very flexible. If a customer has a particular design in mind, but also has a defined budget, our makers are well equipped to deal with that. It might mean variation of material, more or less technical work and so forth, but there’s always an answer. Working with skilled and experienced makers who can provide guidance through the design process often reveals surprising and truly satisfying outcomes for customer needs. 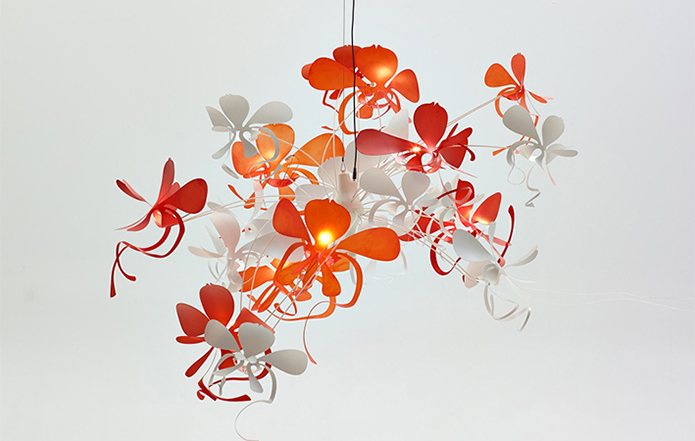 Orchid Light by Marc Pascal, lighting design, Melbourne, Victoria. 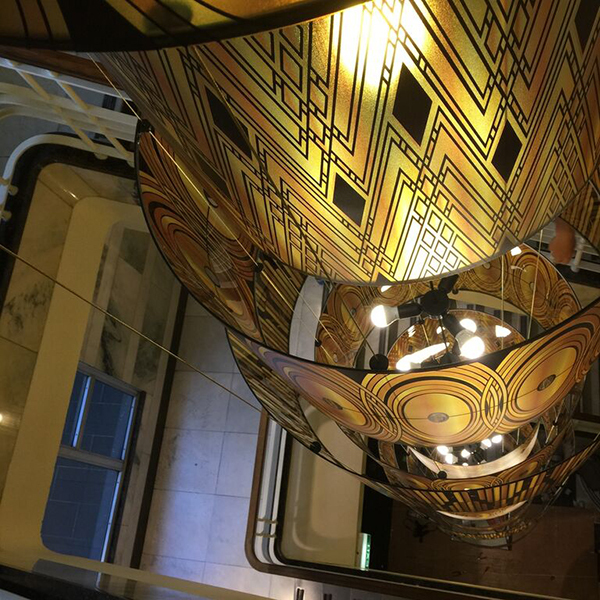 One example was a large lighting installation completed by Ilan El for the Royal Bank Chambers building in the Melbourne CBD. The piece looks like a huge stained glass chandelier, but due to budget constraints was actually manufactured with a clear film material imprinted with symmetrical patterns that reflect the Art Deco design characteristics. The design process went down to a pixel level to insert tints of green to give the effect of glass and the four layers of printing resulted in a textured finish referencing leadlight. The result is still stunning and has huge impact, but the manufacturing process worked to the client budget. Art Deco-style Chandelier by Ilan El, lighting design, Melbourne, Victoria. There is a limit to how much local Australian makers can compete with imported, mass-manufactured or big box retail goods. Perhaps they never will – but nor will the quality of those items match Australian makers. It becomes a question of value – when you can commission a piece from a maker here in Australia, work closely with them, and produce an item (which often has a story ingrained into it) of such quality that you could pass down to your children, where does that leave the off-the-shelf items? 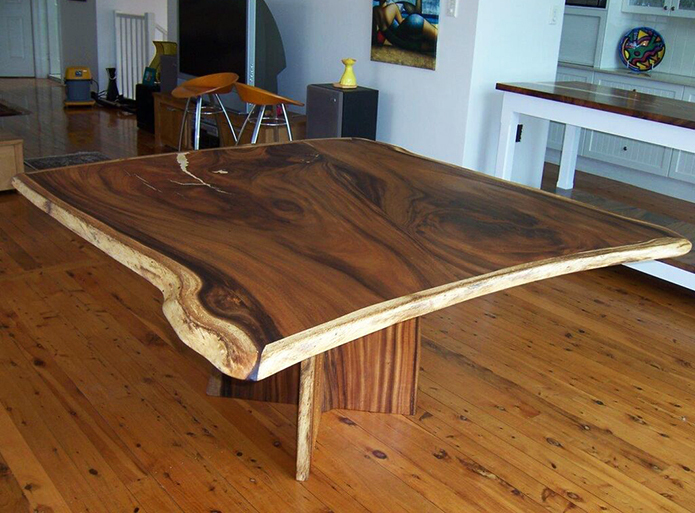 Raintree Table by Vlad & Kylie Kis, furniture design, Sydney, NSW. Makers Lane works closely with the customer from the start of the design process to ensure that we’ve understood a customer brief before we share it with our maker community. We know what it’s like to want something for your home and not knowing the best way to go about it. So we understand that first step, which is working out a concept through to something that can be passed to a maker (or several). Additionally, the backbone to the Makers Lane process is a clear contract structure, and clear expectations around customer service from our makers. 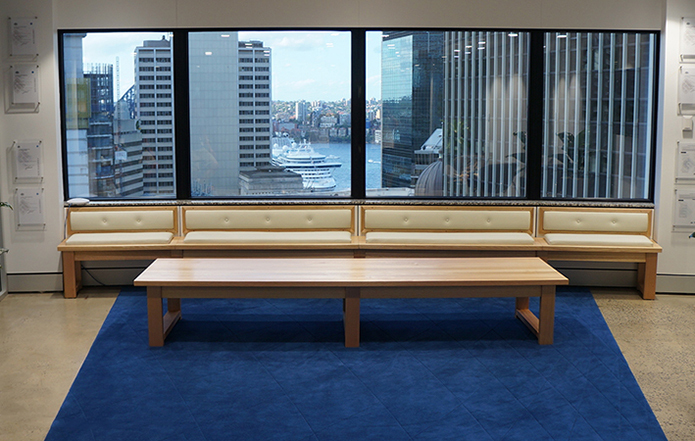 Reception – Australia Square by Christopher Nicholson, furniture design, Wollongong, NSW. If there is ever an issue with a project, Makers Lane is actively involved in mediating a successful outcome for our customers, to ensure that a customer receives the project that they briefed. 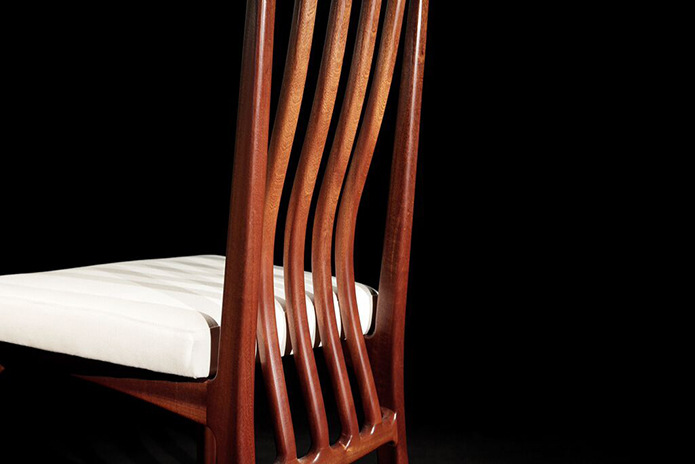 Chair by Gratton, furniture design, Melbourne, Victoria. What are the advantages of choosing a bespoke design and having a piece handcrafted for you? Western society has gone through a period of rampant consumerism – where everything is mass-produced and imported. In this day and age, having an original design is a point of difference when everything is mass-manufactured and readily available. Woolball by Ilan El, lighting design, Melbourne, Victoria. People are becoming more thoughtful in their purchases as they look to enhance their lives by creating a home filled with memories, meaning and fulfilment. People value having a story associated with special items in their lives, whether it’s a dining table or a custom designed engagement ring. Everyone has their own story, and our customers enjoy being involved in the creation of something special. Often a close relationship develops between the customer and the maker, as they are both passionate about the project and the end outcome. So there’s often an emotional benefit that comes from being part of your own creation story. 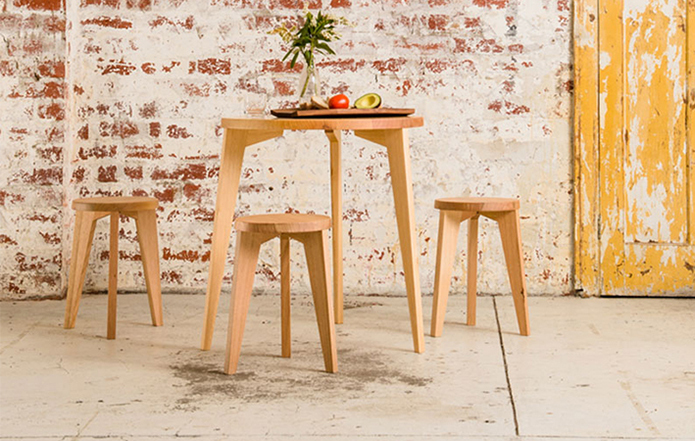 Table and Stools by Gratton, furniture design, Melbourne, Victoria. To what degree are you adding value, as surely there’s a danger that customers could bypass Makers Lane and go to the designer/makers directly? The reality is our customers could approach our makers directly. What we have found is that our makers are fantastic at making but are often not great at marketing themselves. 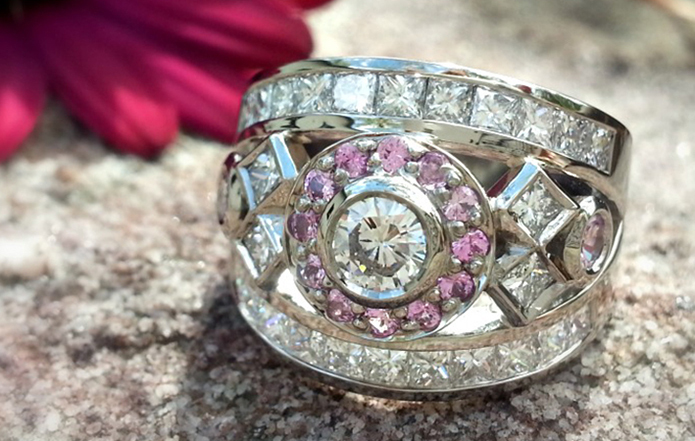 Pink Sapphire Ring by Tracy Kelly, jewellery design, Hawkesbury, NSW. We have created a community of makers and our value lies in the ease of a customer to see the work of many makers and commission their own project – all from a single online point. It can be a very time-consuming process trying to find the right maker for your project and we seek to take the frustration and effort out of the process for the customer. 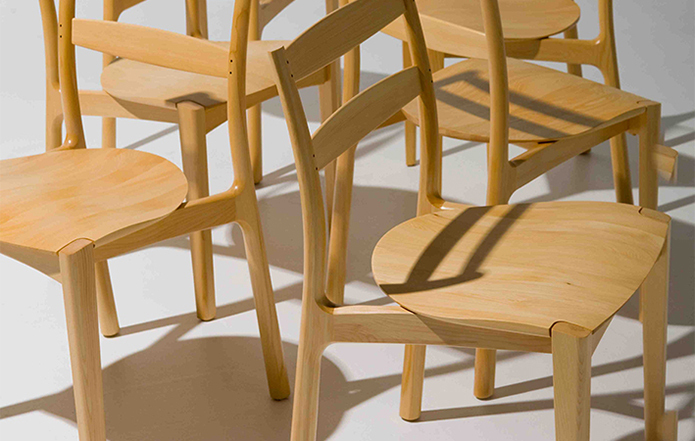 Tamar Chair in Celery Top Pine by Evan Dunstone, furniture design, Canberra, ACT. 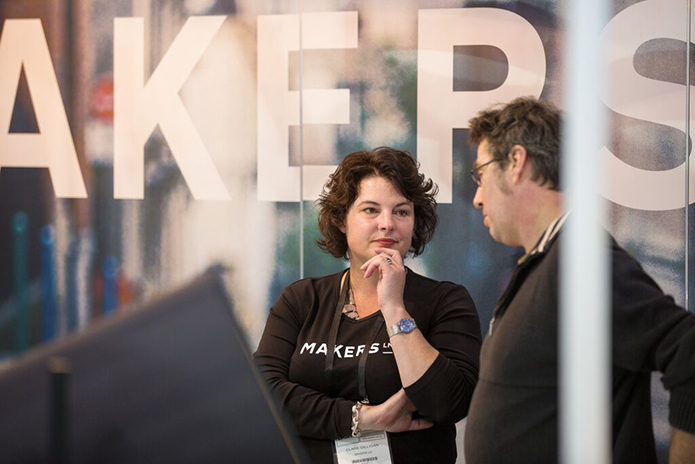 Makers Lane creates a competitive environment for customers to seek proposals for their projects and offers opportunities to our makers to work with customers who might otherwise have not found them. Our family of makers are starting to see real community benefits where they can draw on other makers with different areas of expertise to work on projects they might otherwise need to pass on. We have a vision of a much broader community of like-minded artisans who value the expertise of others in the community that can be harnessed to add value to members of the community. 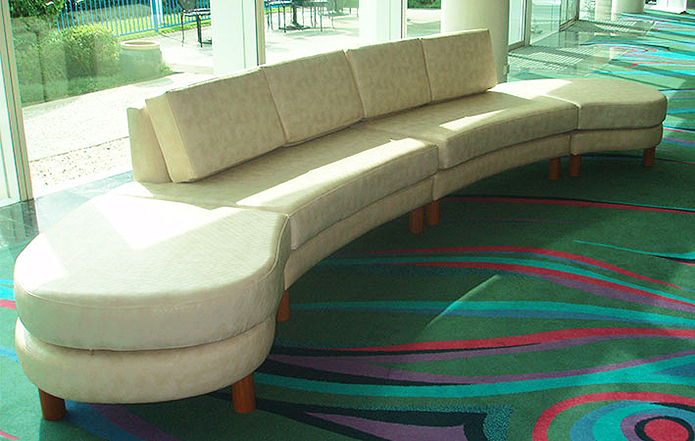 Modular Lounge by James Benigno, furniture design, Gold Coast, Queensland. Could you give us an insight into the diverse community of designer/makers you are working with and their areas of expertise? Our community is extraordinarily diverse. We have no typical apart from a particular attitude and passion for their area. We are constantly amazed by the creativity and passion our makers have. They love a challenge and are constantly innovating in their own space. 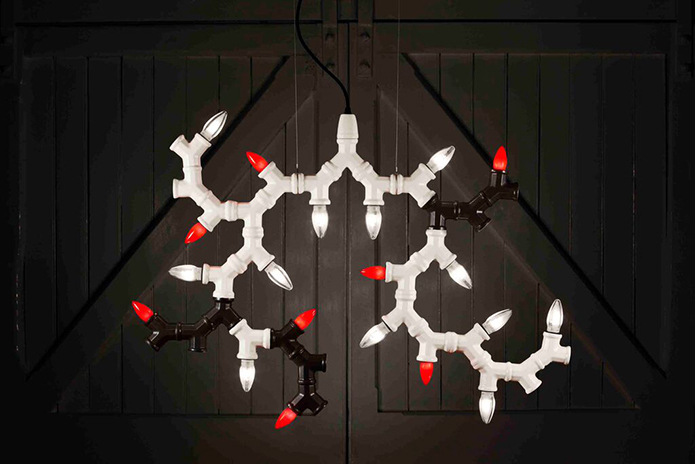 Rudolph Pendant by Volker Haug, lighting design, Melbourne, Queensland. Our lighting designers range from younger industrial designers through to experienced designers who do significant international projects. They work in a huge variety of materials and even use 3D printing technology to help create lighting elements. 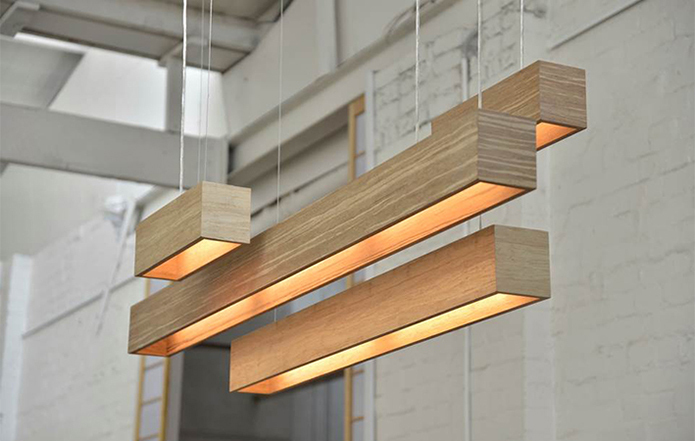 NED Pendants by Daniel Giffin, lighting design, Melbourne, Victoria. Our jewellers range from young designers through to masters such as Graeme Kellet who is celebrating over 50 years in his profession and was a founding member of the Gold and Silversmith Guild of Australia. 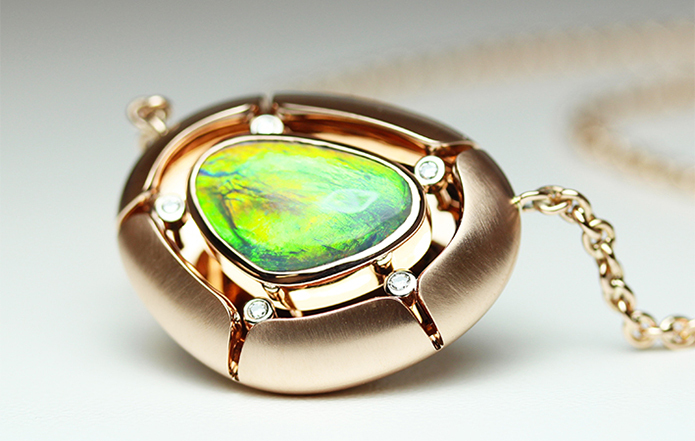 Opal Necklace by Alistair Kelsey, jewellery design, Jervis Bay, NSW. The polished concrete area is a fascinating one as materials and techniques are constantly evolving as it is a relatively young craft. I believe they are one of the most innovative groups of craftsmen, as they are constantly trialling new techniques and setting new boundaries around what can be produced in concrete and concrete finishes. 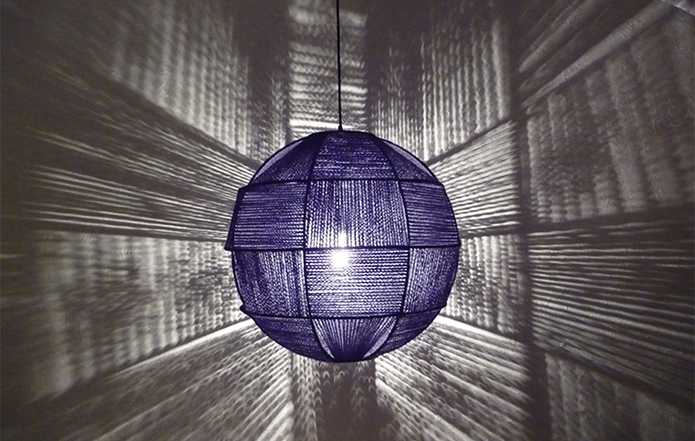 Light Shade by Mitchell Bink, concrete design, Canberra, ACT. 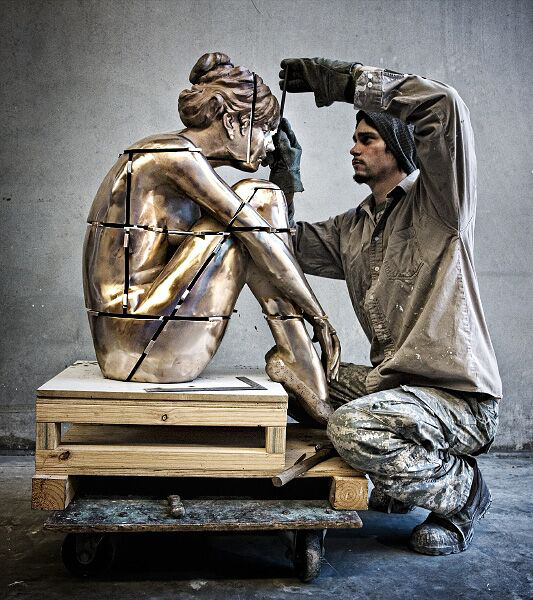 Explore what our designers are creating in metal, around furniture and sculptural pieces. The use of laser cutting technology is bringing art and functionality together for everyday items. Why have an off-the- shelf front door when you can create something unique and extraordinary? 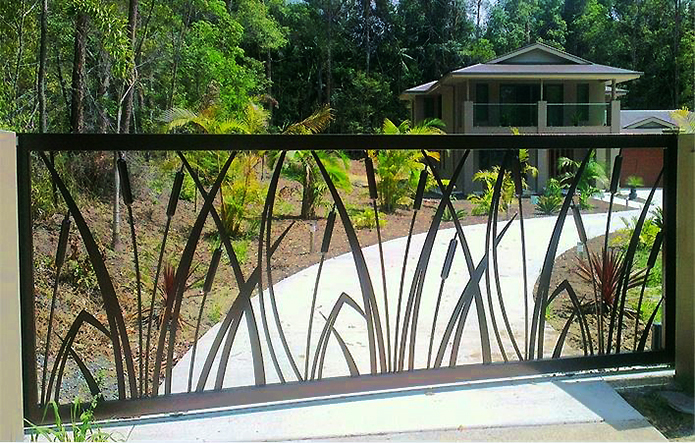 Driveway Gates by Broadcroft Design, metalwork designers, Sunshine Coast, Queensland. The other area that I think will grow is in custom textiles and wallpapers. Interiors are now so personalized, why not be involved in creating your own fabric for feature chairs and furnishings… Wallpapers have also come back into vogue with great leaps in quality and ease of use. They now provide a platform for wall art and personalized spaces. 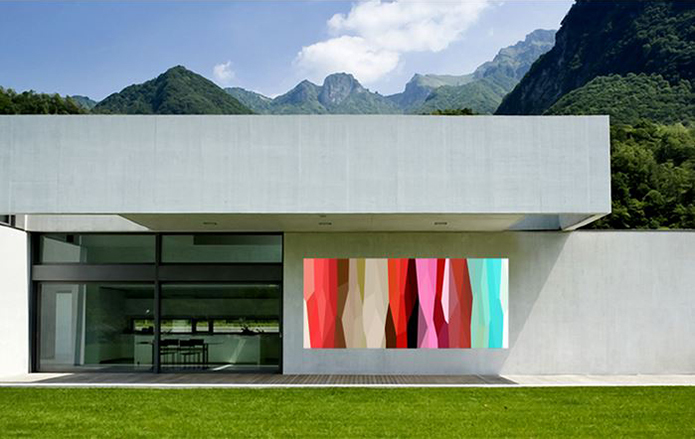 Alicia Exterior Panel by Sonja Robar, artwork design, Melbourne, Victoria. We probably have an even split between professional clients such as interior designers and architects and the non-professional customers. A professional customer will usually know what they are looking for and see Makers Lane adding value by providing a seamless tendering and procurement platform for project elements. Typically this customer is looking for unique design, or they have designed elements for projects that they would like made and they are able to provide a fairly detailed brief for makers. 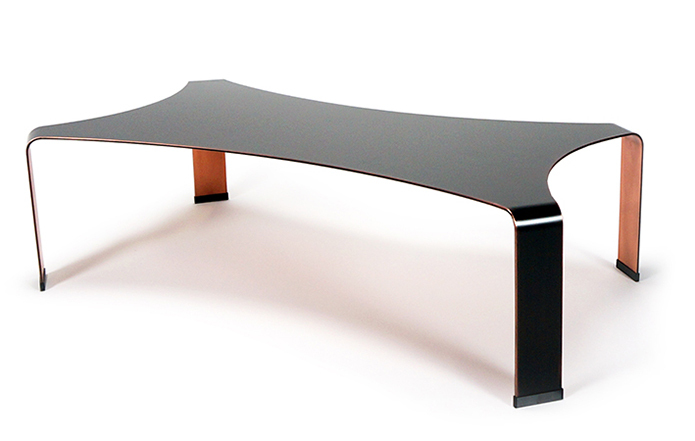 Hairpin Leg Coffee Table by Karl Young, furniture design, Fremantle, WA. This is sometimes true for the non-professional customers but usually we provide a higher level of design advice to help them generate a brief that is detailed enough for makers to cost and provide a proposal. This is sometimes a back and forth process as we narrow down customer likes and preferences, often providing them with options that they hadn’t considered. Bushfire Hero by Savage Design, metalwork designers, Sydney, NSW. How would you describe Australian design, and where does it take its inspiration, as I imagine it takes on a lot of influences from its historical and international origins, but also the Australian environment and natural materials? I don’t think you can put Australian design into a descriptive category. When I look at the depth of design talent on show in Australia, and the breadth of variety in that design aesthetic, I always think there is something for everyone. 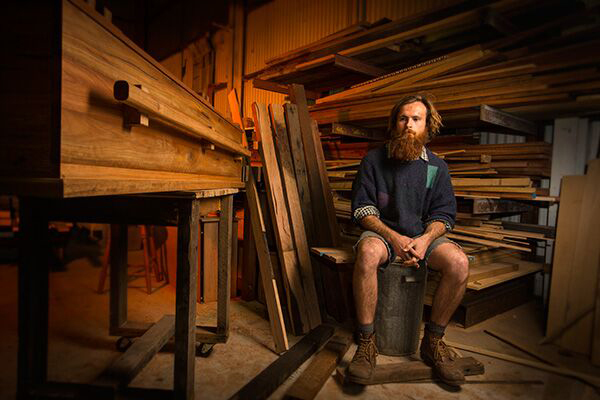 Australia is rich in natural resources our makers can draw from and we are fortunate to have some of the most interesting timbers in the world to create beautiful pieces with. To see a craftsman work with an organic material and bring out the best attributes of that timber is something wonderful. 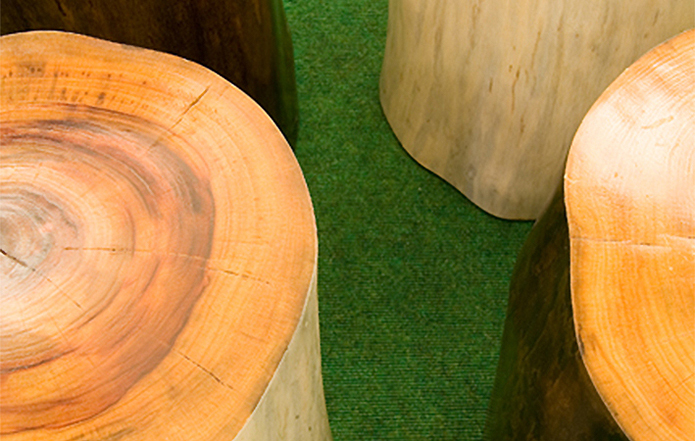 Timber Log Stools by Studio Ham, Blue Mountains, NSW. Australians have always been quite outward looking when it comes to innovation and design. We take on influences from around the world and I see a very open mind to new techniques and products. 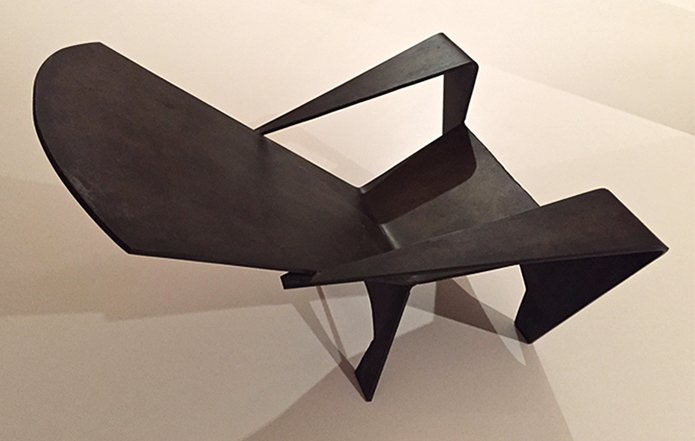 Armchair by Josh and Amy Carter, metalwork design, Sydney, NSW. 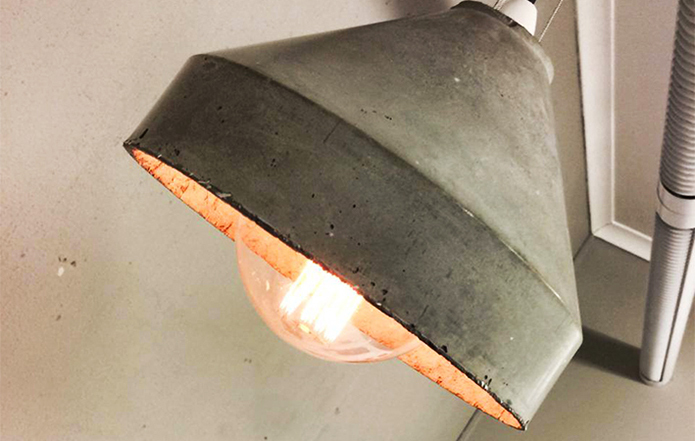 I really enjoy seeing the trend towards incorporating our industrial heritage into furniture, lighting and public spaces. There is a particular creativity wave going on at the moment which is experimenting with mixing hard and soft materials together, such as concrete and timber, to create very interesting textures and finishes. 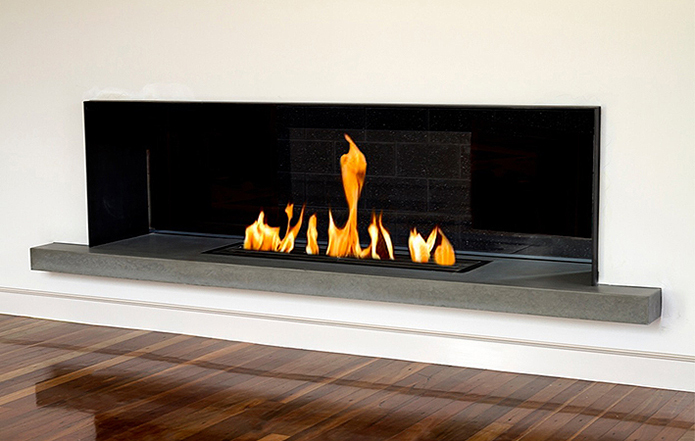 Fireplace by Mitchell Bink, concrete design, Canberra, ACT. In the UK there is a renewed interest in products with provenance, products that have been made by craftspeople and companies with authenticity, is it the same in Australia? We have seen a number of industries moving in the same direction that I believe furniture will. Fruit and vegetables is a good example; there is a much greater demand for organic produce and people are willing to pay a little more to get a premium product that was not produced solely to meet a price point. Craft beer is another great example where people are no longer gravitating to the tried and tested, best-marketed product, but something that they have an affinity with. I think there is a trend generally towards what we hear termed the ‘Maker Movement’ but more broadly is a rejection of mass-produced, disposable items. There is a desire to individualise our spaces and a higher level of value placed on good design, both in our environment and in the items we surround ourselves with. 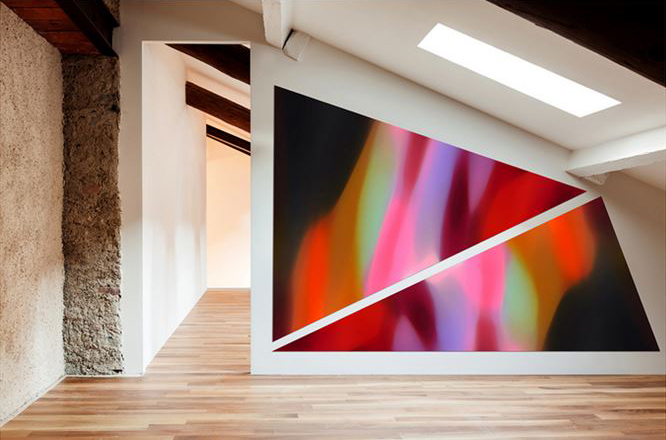 Large Triangular Works by Sonja Robar, artwork design, Melbourne, Victoria. Settling for commercially produced products that meet most requirements is not going to be the norm for too much longer – particularly when people realise that they don’t need to. Consumers are going to demand differentiated products and I think we are well placed to take advantage of this shift. I also think there is growing awareness of sustainable manufacturing and resource use in the western world – that purchasing furniture that you dispose of every 5-7 years really doesn’t deliver value for either the customer or society. The use of toxic materials in manufacturing processes are also a concern as we have become too removed from the production of the items we use every day. 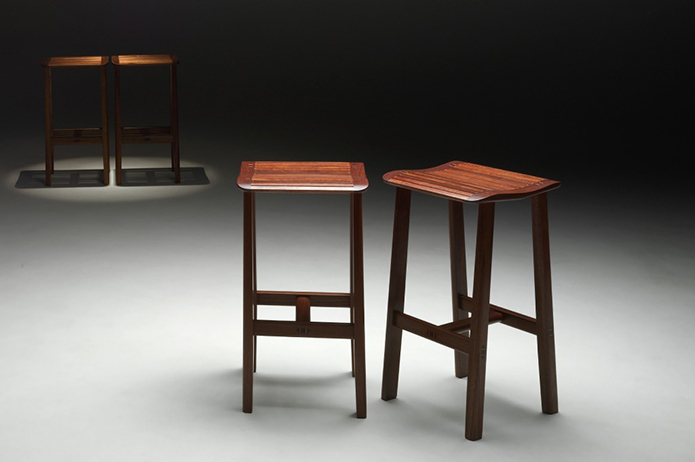 Waterfall Stools by Evan Dunstone, furniture design, Canberra, ACT. The ethical behaviour of companies and customer responsiveness has become a factor in people choosing where to spend their dollar. Dealing with a maker directly, supporting your local economy, and achieving a value outcome is definitely behind some of our customer decisions. 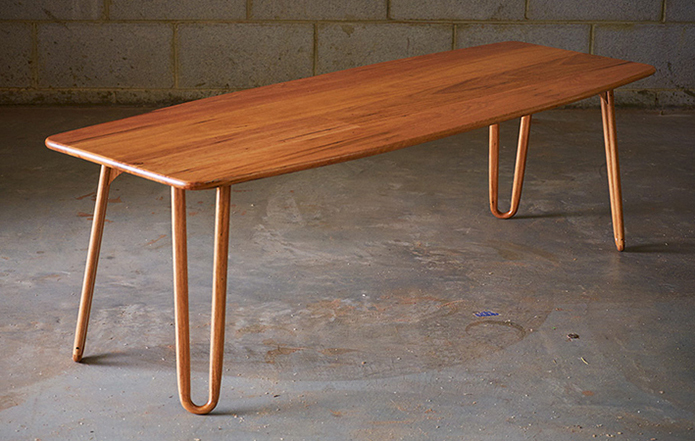 Christopher Nicholson, furniture designer, Wollongong, NSW. On a final note, what future plans do you have for Makers Lane? Our immediate focus is on expanding our maker and client reach, making the brief and project process as smooth and collaborative as possible and – most importantly – learning as much as we can about how we can add value to our clients and makers. Understanding our clients is top priority for us. At the end of the day, we are here to solve their problems, and without getting to know them, we have no chance of knowing what problems we really need to focus on. Our business is a marketplace, and staying in touch with both sides of it is essential. 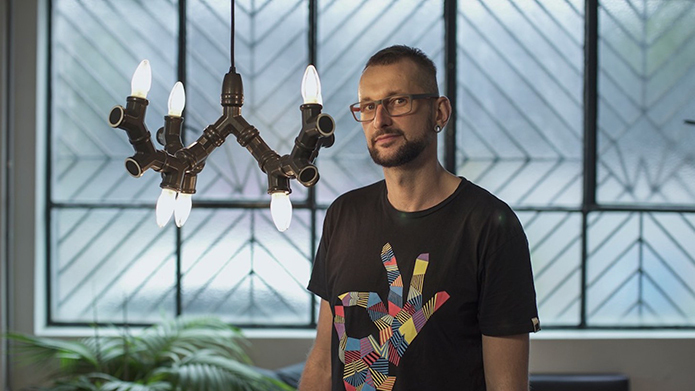 Volker Haug, lighting designer, Melbourne, Queensland. We designed and built our technology platform to scale internationally, so moving to another market is technically very simple. There are also a lot of opportunities to share services which could help us scale. In saying that, this is effectively a localised market space, so we would need to have the right people with the project and design industry experience on the ground in that new market before we considered that move. 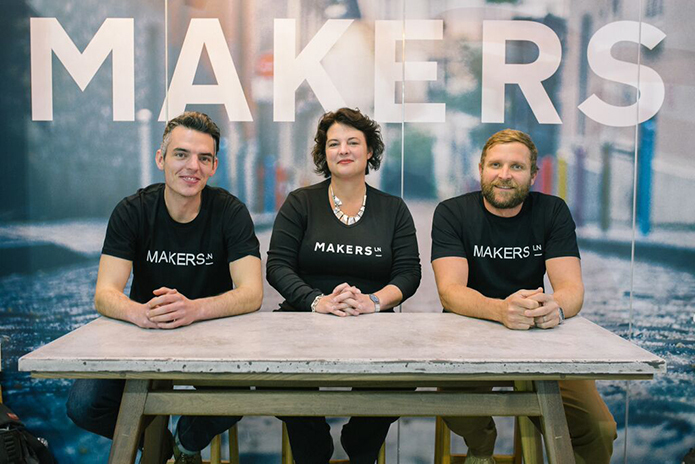 Co-Founders of Makers Lane:, Patrick Gilligan, Clare Gilligan & Craig van Zyl. Online sales will happen. The key here is staying true to our brand and the problems we set out to solve. Our passion is for custom made products and that must be true for any product that is promoted on Makers Lane, be that a product for sale or simply for promotion. There are challenges with fulfilment and inventory management here, none of which cannot be solved, all of which are of slightly lower priority than our current initiatives. Beyond this, we have a long list of aspirational goals… we’ll keep you posted when these launch. Thanks to Clare Gilligan for taking time out of her busy schedule to answer our questions. All images courtesy of Makers Lane.